Due to recent spikes in temperature, there will be some speed restrictions on sections of Metro Rail throughout the day. Speed restrictions are precautionary measures during extreme weather conditions to ensure we do not cause damage to the tracks or overhead power lines. For up-to-date service advisories, follow our general Twitter stream or our Twitter stream with only service alerts. Hi Steve, I’m curious if Phoenix, Arizona also has to place these restrictions on their light rail lines, which also run at-grade and aerial? If so, it would mean their entire system has to operate under these restrictions pretty much every day between May and October! Or was the Phoenix system somehow built differently so extreme heat doesn’t cause delays and power strains on the system? Didn’t Metro design the light rail system to operate without delay in conditions of 100 degree weather? 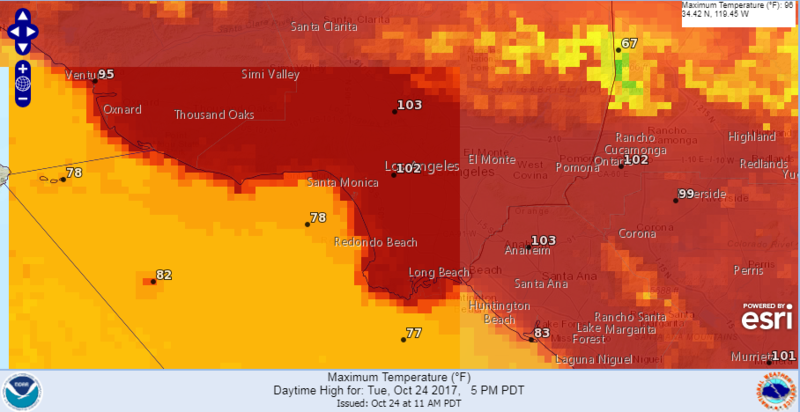 It’s definitely not uncommon for it to hit 100 degrees for at least a few days a year in Los Angeles, including in the basin (and this was the case even in the 80s and 90s, when a large part of our system was designed). this would be a great time to run more 3-car trains to alleviate the crowding.